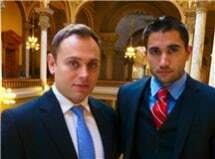 The firm's co-founders both graduated from Indiana law schools in 2009. Matt Black earned his Juris Doctor from Indiana University Robert H. McKinney School of Law in Indianapolis, while Adam Clay earned his Juris Doctor from Indiana University Maurer School of Law in Bloomington. The two attorneys met when they worked together as Indiana deputy attorneys general, resulting in their continued team approach to legal matters. If you live or own a business in the Indianapolis area, you can turn to the experienced lawyers at the law firm of Black Clay LLC for help. Because both of the firm's attorneys pride themselves on providing individually focused legal representation to each of their clients, you will know that they will give you and your case the attention deserved. To make the law office's services accessible to all of those in need, Black Clay LLC accepts credit cards as a method of payment and offers free initial consultations. Our attorneys are experienced litigators and former deputies for the Indiana Attorney General’s Office, and will fight vigorously to protect your rights. If you or your family is experiencing legal issues, then you need a law firm whose lawyers will take the time to ensure that your family’s legal needs are met. Our attorneys will work closely with you to ensure that your will, trust or other estate planning tools fit with your needs for the future. The attorneys at Black Clay LLC offer comprehensive business formation services to help small businesses establish the foundation to grow and prosper. Black Clay LLC strives to be a cutting-edge law firm providing efficient and cost-effective legal services to individuals, families, small-business owners, and entrepreneurs.